Want to get disoriented in a city? 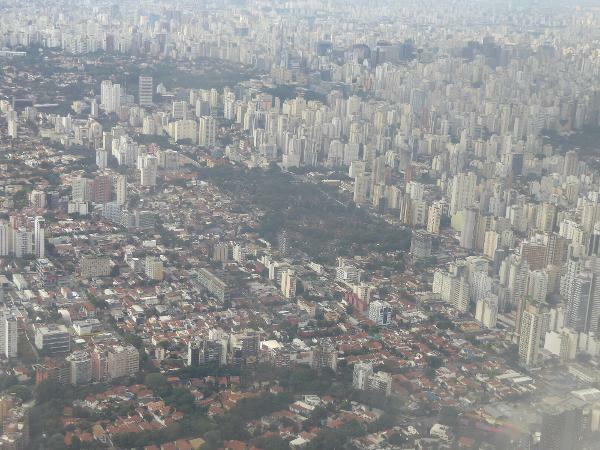 Try São Paulo, with 12 million in the city, 21 in the metro, and no water or mountains to help you get your bearings. We'd better play it safe and stick to just one of the city's 32 regional prefectures. It's the one called Sé ("Cathedral") and is the most central. It has a population of over 300,000 people, which makes it the smallest of the city's prefectures, but it's still too big for us. 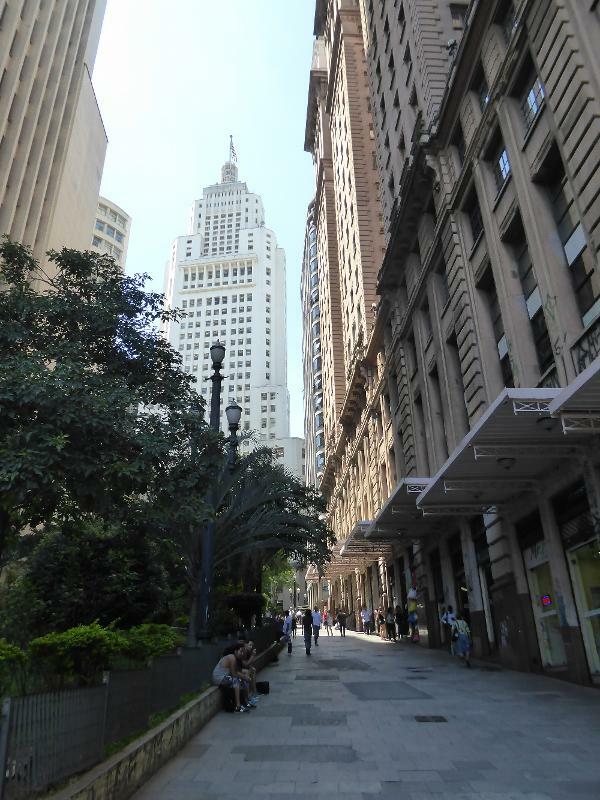 We'll sample two parts of it: the historic core and, a mile and a half to the south, Paulista Avenue. 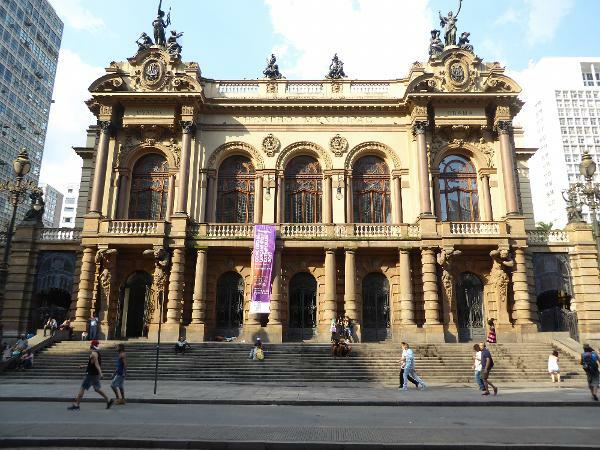 Worse, we'll lean heavily on the Tourist Information Center's Architecture Tour to São Paulo's Historic Downtown. I know, I know. It's pathetic, but do you speak Portuguese? That's what I thought. So cool your jets until something better comes along. Here we are at the site of the city's founding in 1554. 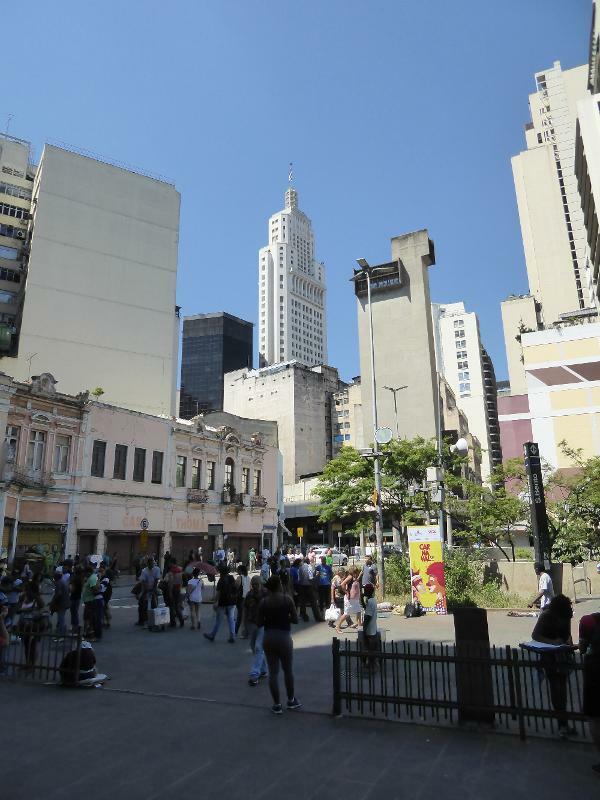 São Paulo was then the only Portuguese settlement not on Brazil's coast, and it would grow so slowly that more than 150 years passed before the village was officially designated a city. That was in 1711, and real growth wouldn't come for another 150 years, with the opening in 1869 of a railroad down to the coast. 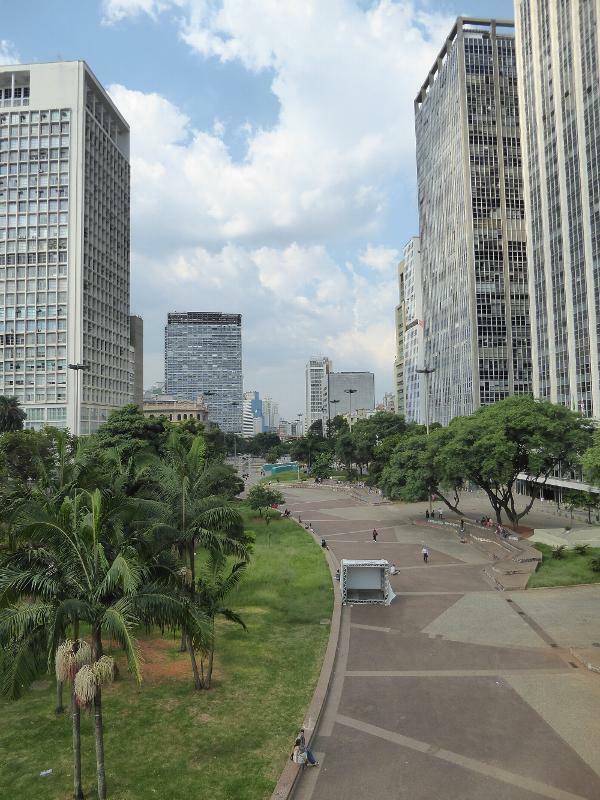 Even then, São Paulo was a tiny place: as late as 1890 the population was 25,000. Hard to believe. So here's the Pateo do Collegio, site of a Jesuit school founded with the settlement itself in 1554. 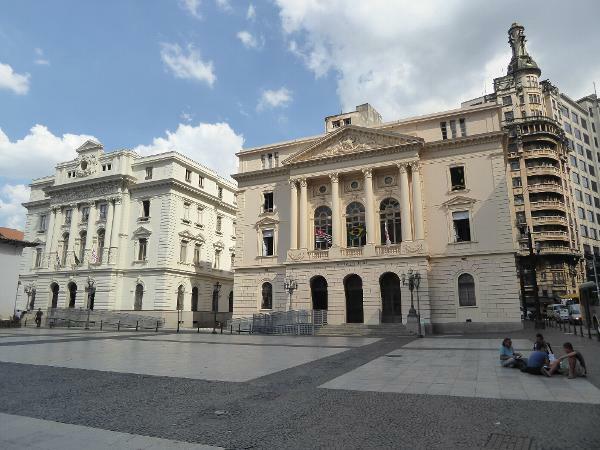 Sounds venerable, but Jesuit properties around the Portuguese world were confiscated in 1759 by the redoubtable Marquis Pombal, and the school in São Paulo became government offices. Eventually it was demolished, beginning with the attached church in 1896. In 1954, with the Marquis in no position to argue, the government gave the site back to the Jesuits. In 1979 they reconstructed their old school, now mostly a museum. How's that for tenacity? A couple of blocks away there's another church. 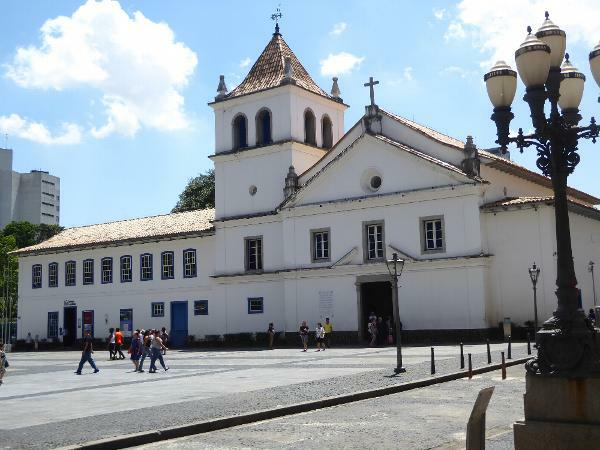 The site has been occupied by the Carmelites since 1592, but you know the drill: the present church, the Igreja da Ordem Terceira do Carmo, dates from about 1750. That's actually very old for São Paulo. Here's the interior, simple in outline but rococo in detail. The painting is by Frei Jesuino of Monte Carmelo (1764-1819), a mulatto son of a slave. Poor choice of parent: because of his ancestry, Jesuino's application to join the Carmelites was rejected by the Holy See, notwithstanding a petition of support from the local authorities, who appreciated the exceptional talent in their midst. 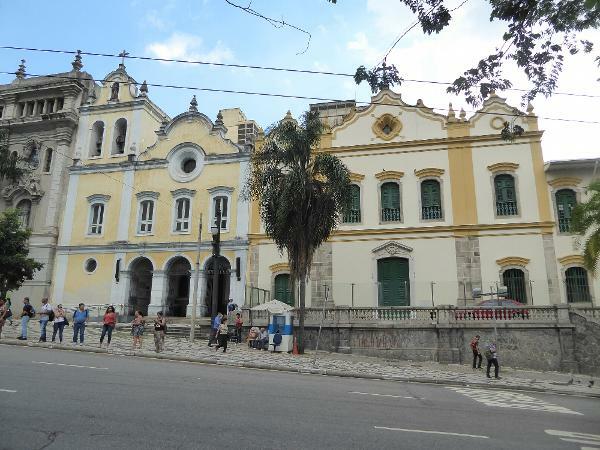 A few blocks away are two Franciscan churches best known as the Conjunto Franciscano: on the left, from the 1640s but remodelled in the 18th century, is the Convent and Saint Francis Church; on the right, from 1787, is the church of the Chagas do São Francisco or Wounds of Saint Francis, from 1787. 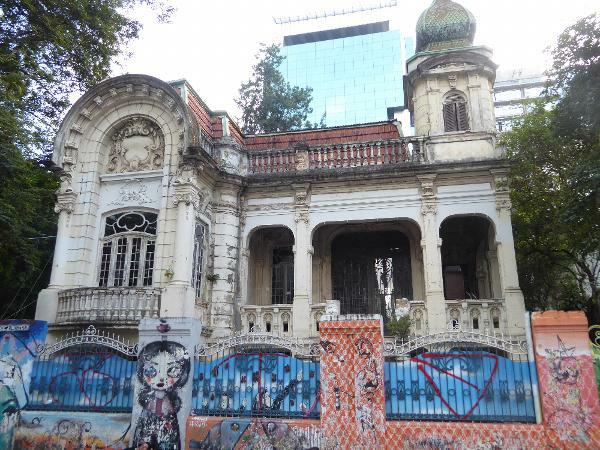 The convent was demolished to become part to the law faculty of the University of São Paulo, truncated here on the left. 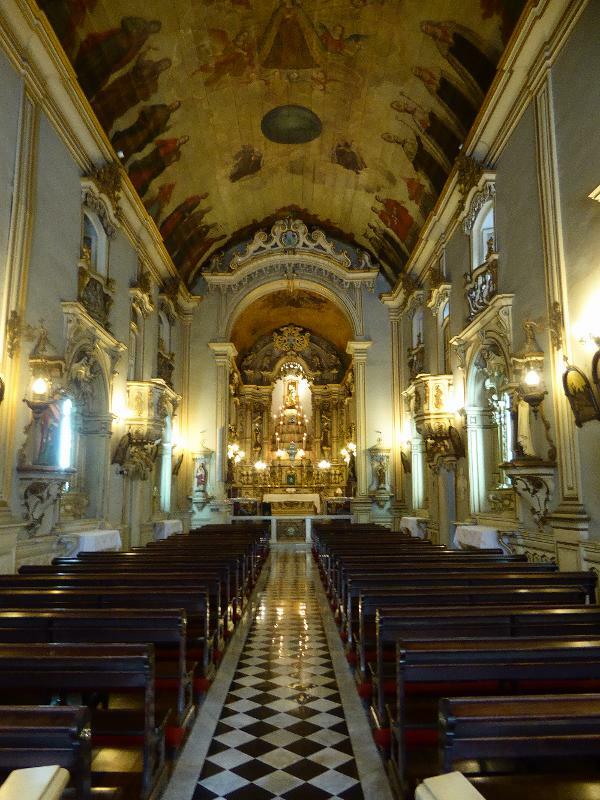 Here's the interior of the older of the two, though it was rebuilt in 1828, after a fire. One more not-so-old-as-you-think church. 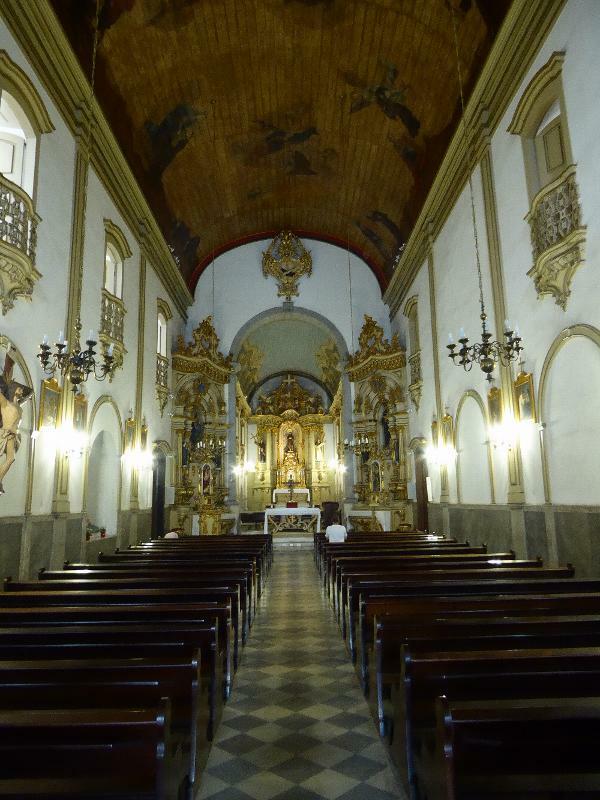 Standing in the Preça do Patriarca, it's the church of Santo Antônio, on the site since 1592 but renovated many times since. The present facade may look as though it's from the 18th century, but it was actually remodeled in 1919. A photograph from 1862 shows the church with its tower not centered but at the left corner. The interior, from about 1780, remains the oldest in the city. Baroque, baroque, baroque. It's hard to find houses from the early days, but here's a description of the town from about 1890: "The streets are narrow, but have both centre and side pavements, and the houses are of earth, plastered over, and of clean, comfortable, and cheerful appearance. They are all roofed with tile, and for the most part two stories high, with occasional balconies." (Lippincott's Gazetteer of the World, 1893.) 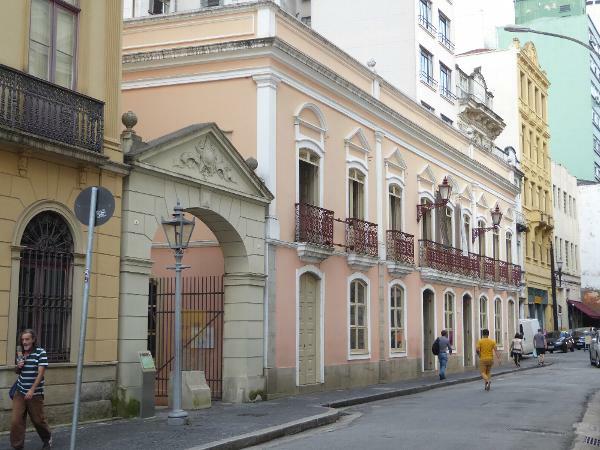 For lack of such a street surviving, try this late 18th century colonial mansion, the Solar de Marquesa de Santos; named for the Marchioness of Santos, who lived here for 30 years, including a stint as the mistress of Dom Pedro I. It's the oldest surviving house in the city. The gate on the left marks a passage downhill to a stream. The alley has been opened and closed over the years. When the Marchioness bought the house in 1834, she quite properly closed it, much as, with equal propriety, fatcat fbeachfront owners in recent decades at Malibu blocked access to the ocean. The gate itself was added in the 1990s to mark the passageway, open once again. The large house on the left, known as Casa No. 1, was built about 1880 and used for various purposes, including as a police station. The site was earlier occupied by a 17th century house of rammed earth. About 800 meters to the west, there's this monument, the Obelisk of Piques. 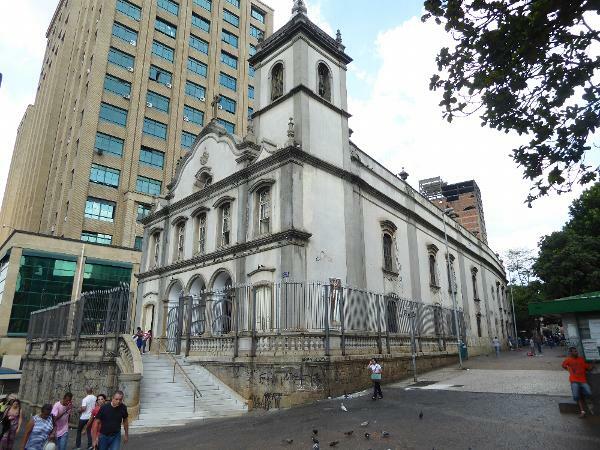 From 1814, it's the oldest monument in the city and marks the east end of a road built at that time from São Paulo to the interior, including Sorocaba, about 50 miles due west. The government ordered a military engineer to build a fountain here. 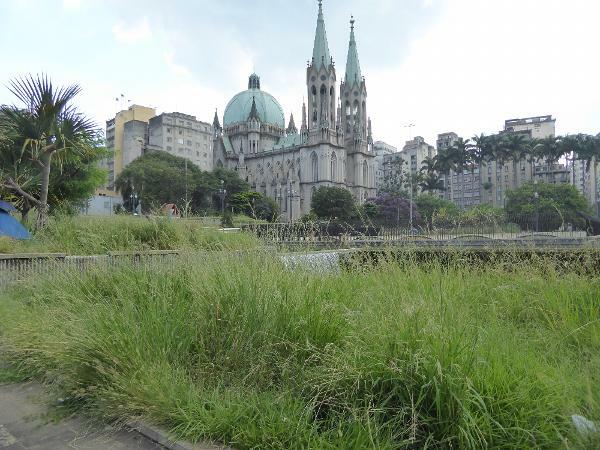 It was a pool, in fact, with water coming from the Tiete River and continuing on to a pond presently in the Ibirapuera Park, about three miles to the south. With leftover stone, the engineer asked his mason to add this obelisk to memorialize the government's devotion to the public welfare. 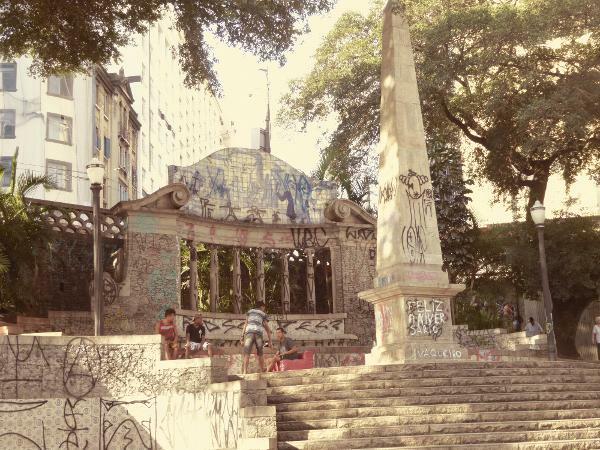 In 1872, the world having moved on to railroads, the fountain was removed, but in 1919, Washington Luis, then the mayor of São Paulo but later a president of Brazil, ordered a redesign retaining the obelisk but adding the tiled portico and stairs. Presto! 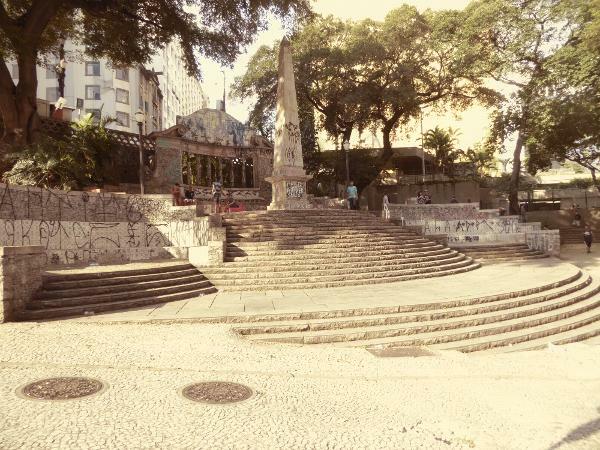 the Largo do Memoria. In 2005 the monument was cleaned up, but it has since been once again defaced. By late in the 19th century, the old colonial town had become a commercial center. Here's the Casa de Boia, the so-called "Float House," built by Rizkallah Jorge, locally famous for the development of flush toilets, a precious innovation in the fight against yellow fever. 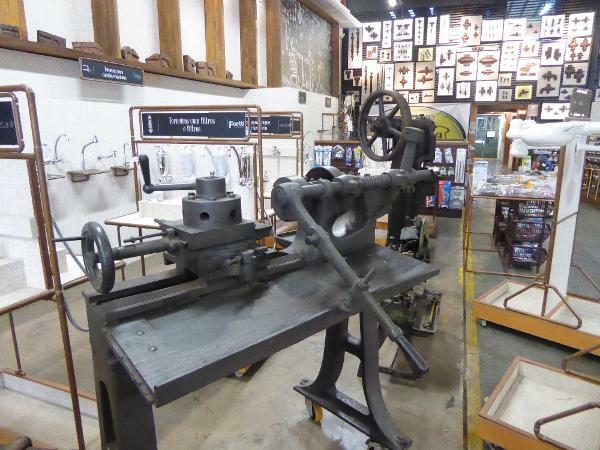 The shop still sells plumbing fixtures but sets aside some floor space as a museum of plumbing technology. 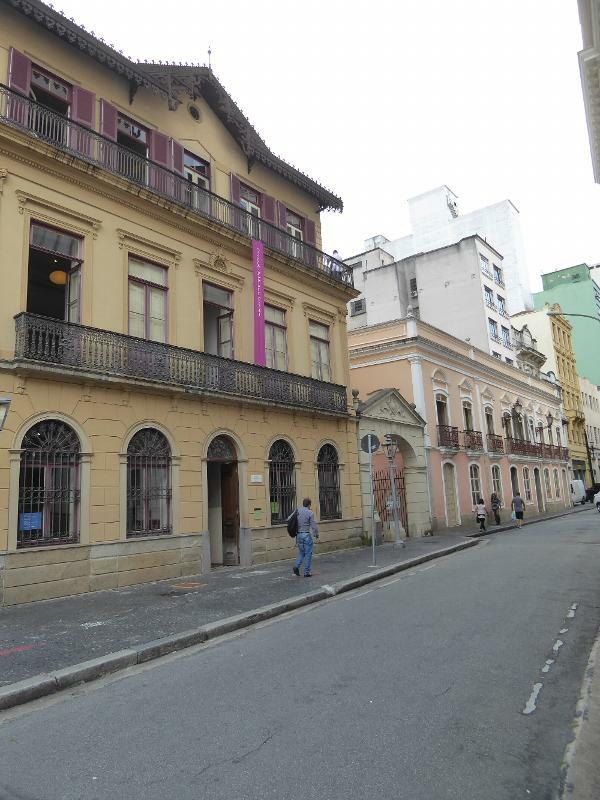 Streets were lined with heavy, low-rise masonry buildings like these, including the Hotel Palermo at 456 Florencio de Abreu. Still in business, too, if you're not a princess. 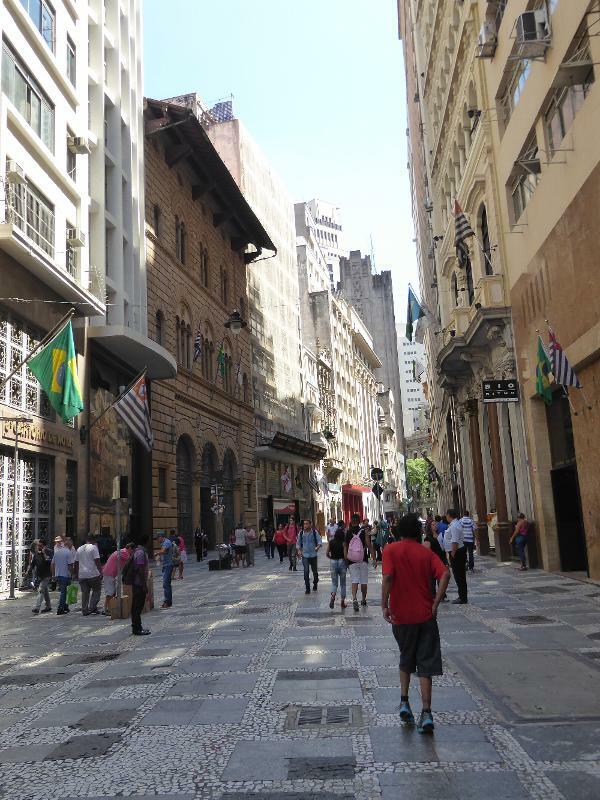 Some of the streets of this old core have been pedestrianized, including this one, Quinze de Novembro. (The name mark Republic Day and the abdication of Dom Pedro in 1889.) The palazzo on the left now belongs to the Santander Bank. Don't overlook the hanging streetlights. The lights installed here in 1907 were some of the first in the country. Neocliassical government buildings arrived in the 1890s to house the ministries of agriculture (on the left) and finance; presently, they're both used by Justice and Citizenship. They open onto the Pateo do Collegio. The self-respecting city had to have a municipal theater. 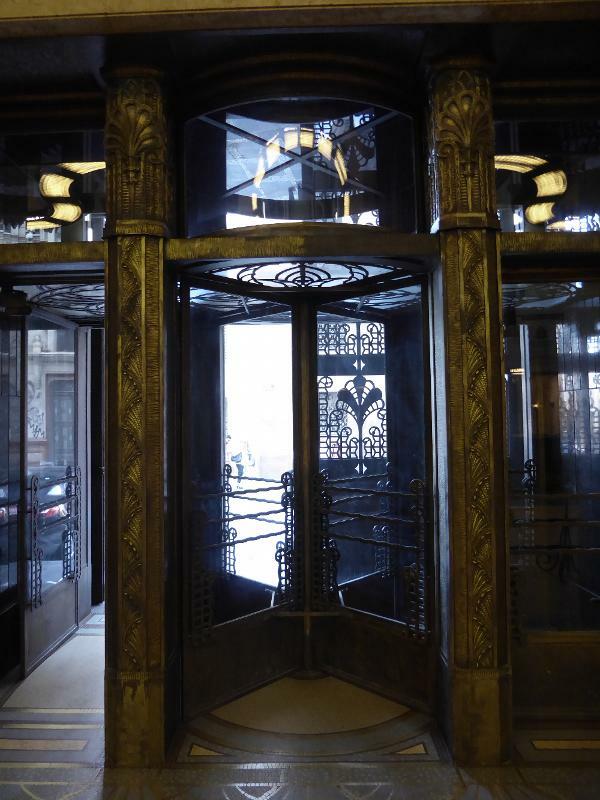 One opened in 1911 and was restored a hundred years later. It's not quite as wide as the Paris opera, but inch for inch is almost as grand. 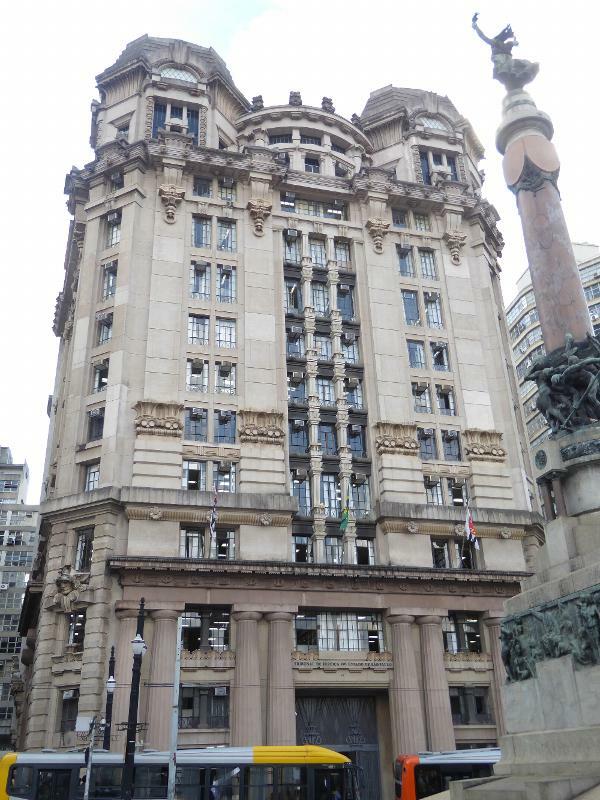 The architects were Domiziano Rossi and Claudio Rossi, unrelated but both working in the very busy office of Ramos de Azevedo. 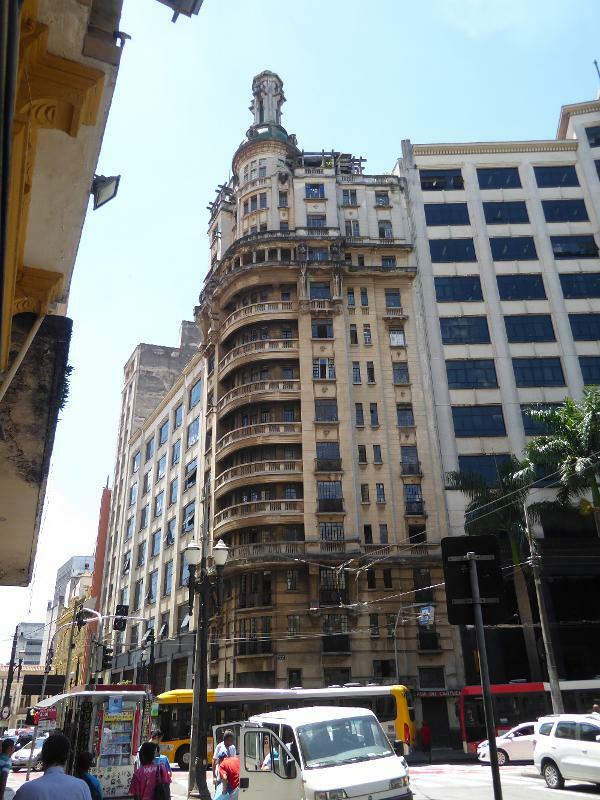 The Edificio Guinle, from 1916, is perhaps the city's first skyscraper, but it's not steel-framed. Instead, it's made of reinforced concrete. On the right is the much later Edificio Triangulo, 1955. Underwhelmed, are we? Will we change our opinion if we learn that it was designed by Oscar Niemeyer? 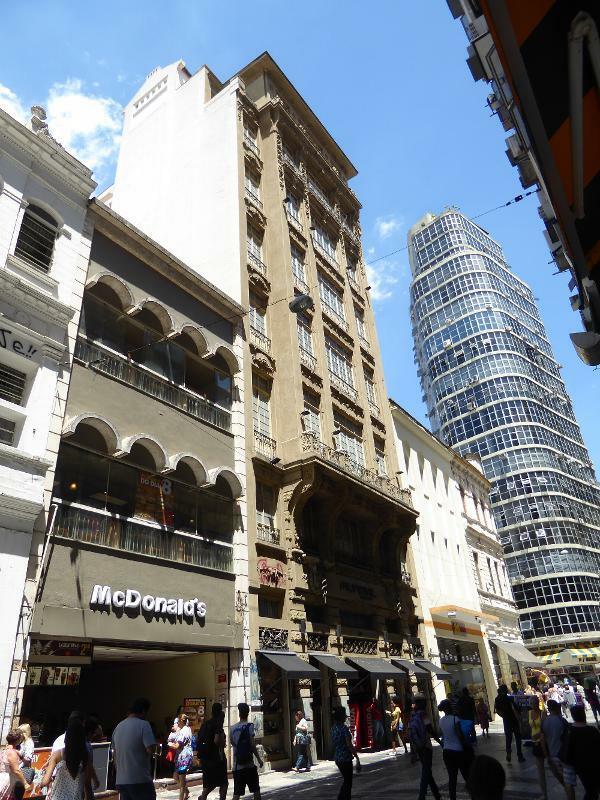 The facade of the older building remains loyal to the 19th century, though the original owner would probably be appalled to see a shoe store on his ground floor. Here's another early highrise, the Edificio Rolim, from 1928. 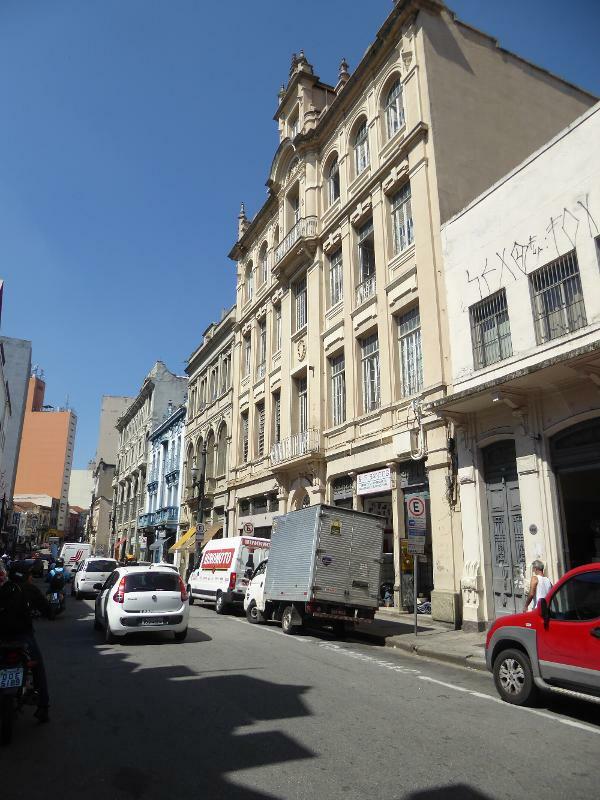 The architect was Hipólito Gustavo Pujol, who had earlier done the Guinle Building. 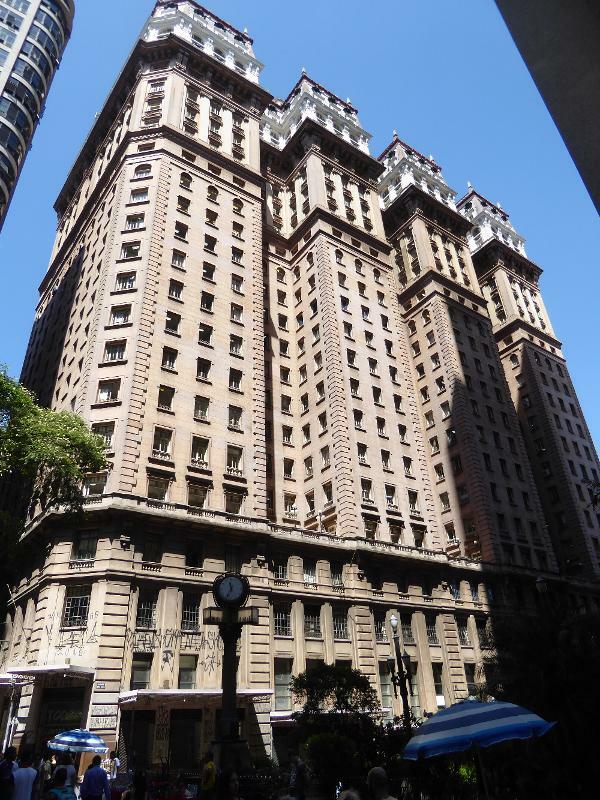 An ad from 1930 spoke of the buildings "magnificent facilities with all the luxury and comfort," and it invited "advocates, doctors, engineers, dentists and brokers... unhappy or ill-placed to visit the building without any commitment. 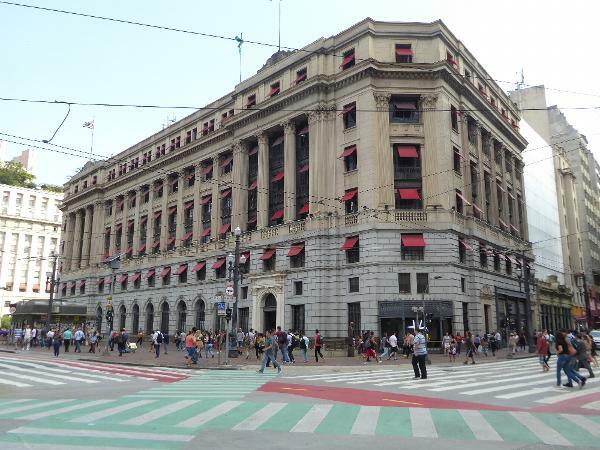 This is the down-to-business Edificio Alexandre Mackenzie, named for the Canadian who for decades ran the São Paulo Tramway, Light, and Power Company--the same company that put up those streetlights in front of the Santander Bank. The company in 1912 became part of Brazilian Traction, famously the biggest Canadian overseas investment and owning the Rio de Janeiro tramway company as well as the one in São Paulo. The company's Brazilian properties were sold to the government in 1978, but the company itself remained active in Canada as Brascan until 2005, when some sensible person suggested a safely bland name. Enter Brookfield Asset Management. 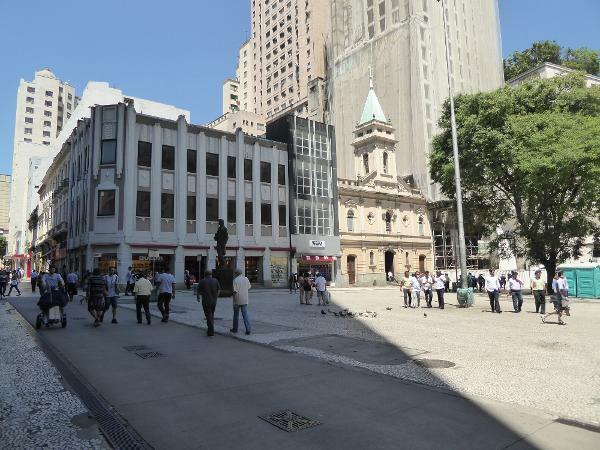 The old São Paulo offices are now a very crowded shopping center. 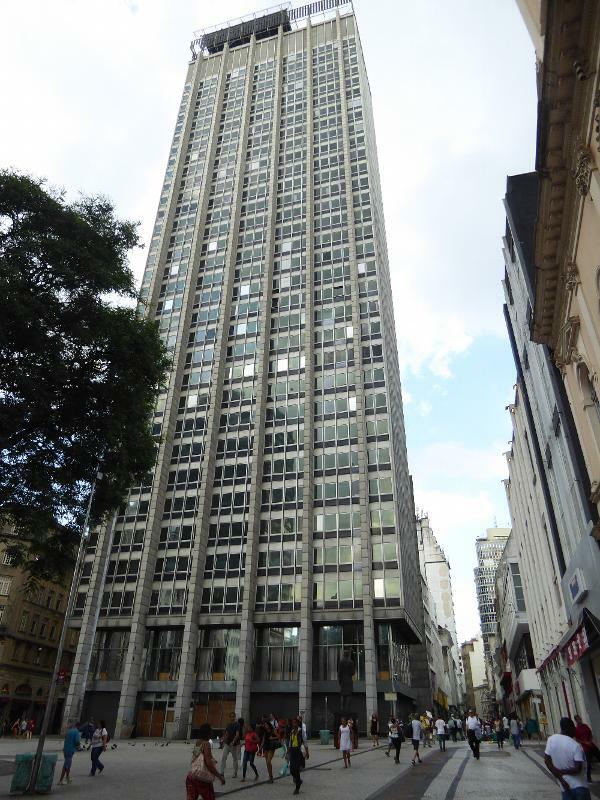 Here's the famous Edificio Martinelli, from 1929 and until 1936 the highest building in the world outside the U.S. The building had a Hungarian architect, William Fillinger, but it also had a very assertive owner. Giuseppe Martinelli wanted 30 floors, and he got them by adding his mansion at the top. Martinelli was an immigrant who became a butcher before starting to ship food to Europe. This was a smart move in World War I, and Martinelli began dreamimg of a mixed-use tower, part commercial, part residential, part hotel. 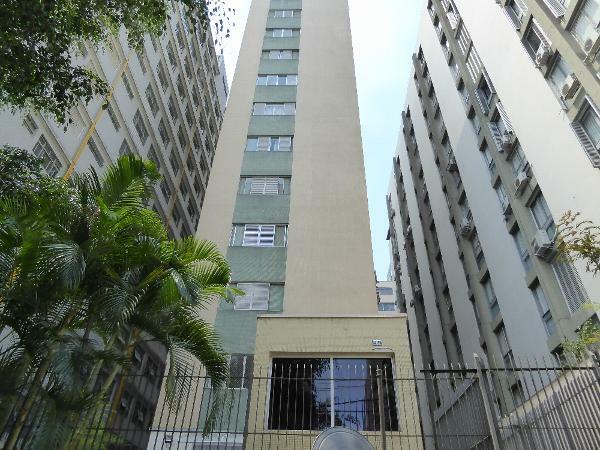 He built it, and it became Brazil's first condominium. Things went famously until 1929. An Italian bank, ICLE, bought the building from Martinelli, only to wish it hadn't. That's because World War II came along, and the property was confiscated. Things went downhill fast, with the building becoming a tenement known as Building America. Eventually the residents were evicted and the building was reinaugurated in 1979. 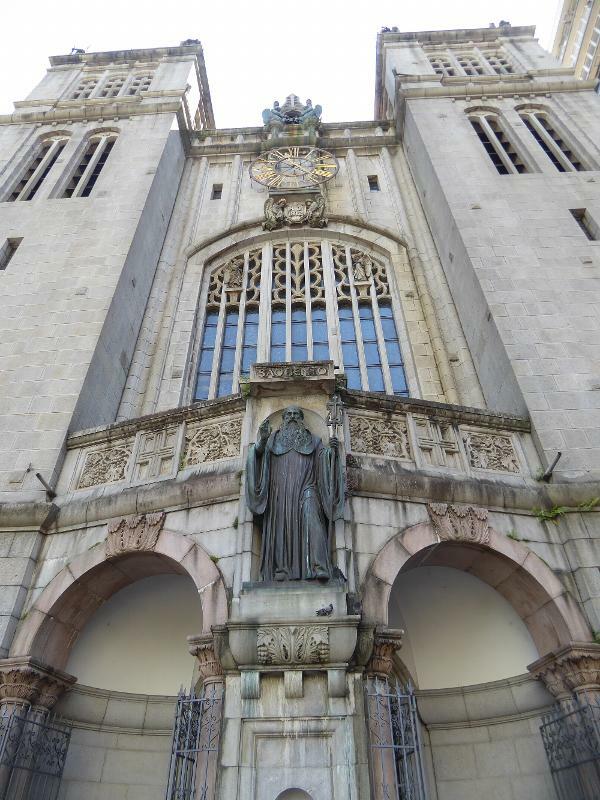 Still about a third privately owned, it is partly occupied by government departments of municipal planning. 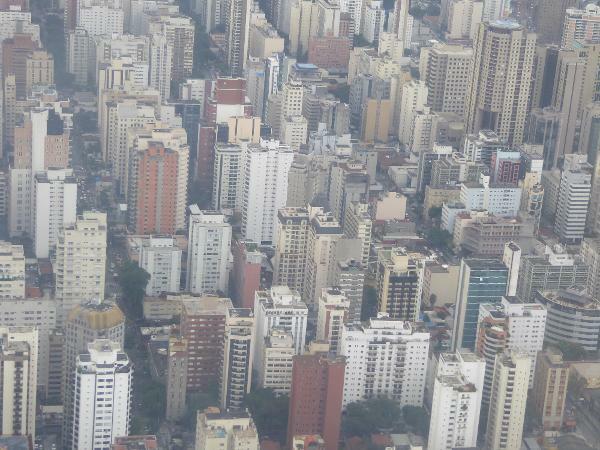 Martinelli avoided the building after he lost it but went on to build eight highrises in Rio. 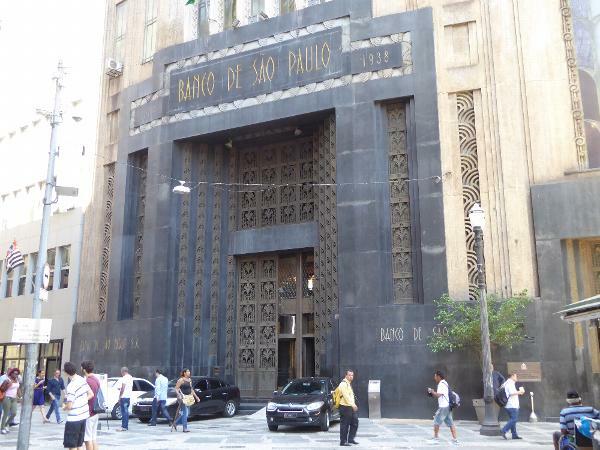 The former Banco de São Paulo, completed in 1938. 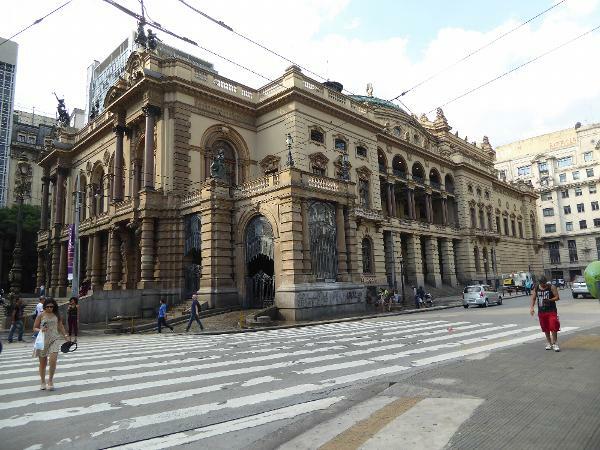 The owners of this private bank were tired of the classicism characteristic of Brazilian banks, and they had the freedom to choose an architect who would give them something else. Álvaro de Arruda Botelho gave them an Art Deco palace. 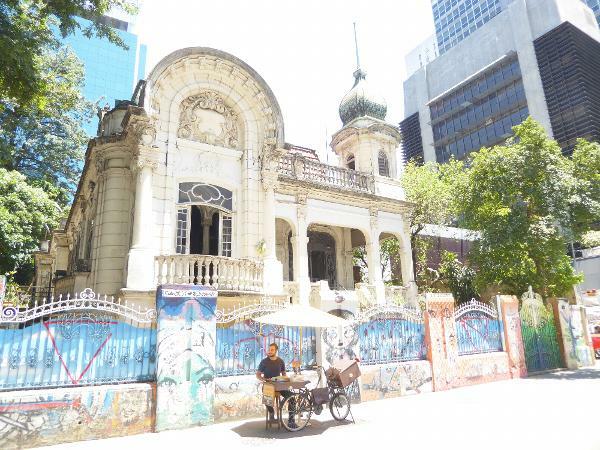 In 1973 the bank was swallowed by the State Bank of Sáo Paulo (Banespa), and this building became the home of the state secretariat of sport. The old banking hall remains open as an architectural monument. 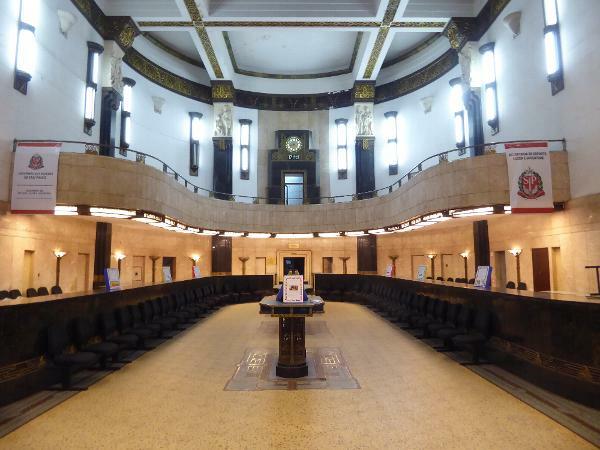 The banking hall manages to be both austere and sensuous. Tricky combination. 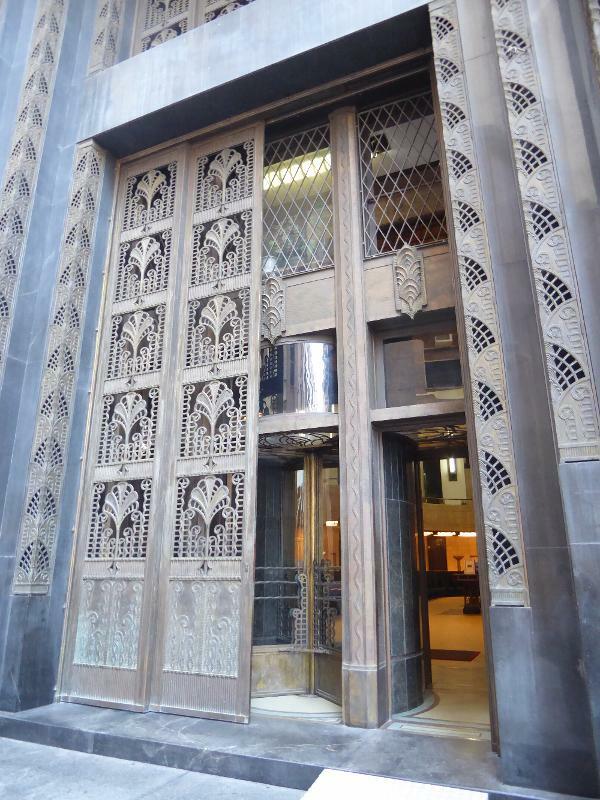 The Stock Exchange from 1937 fuses Doric severity with Mayan exoticism. Since 1977 it's been the First Court of Civil Jurisdiction. 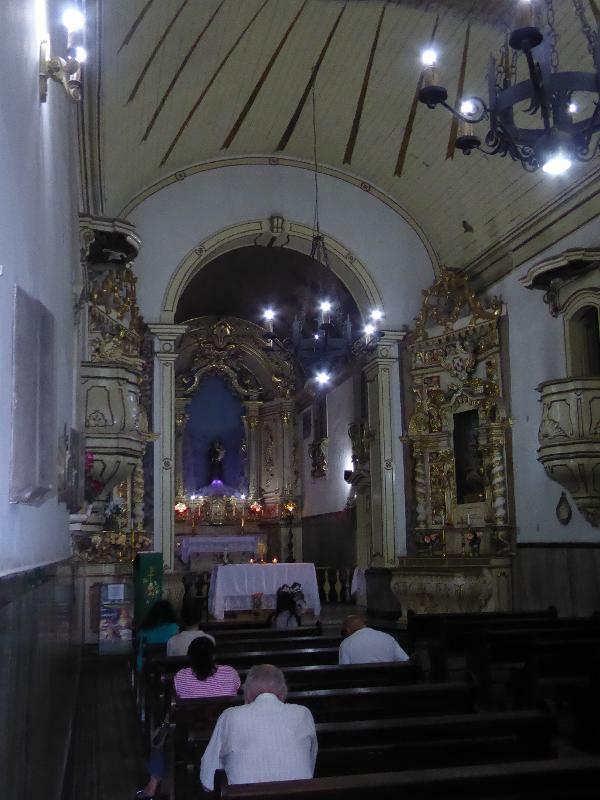 It faces onto the Pateo do Colegio, which makes it seem like no respecter of tradition, except for the fact that it's older than the church rebuilt by the Jesuits in the 1970s. 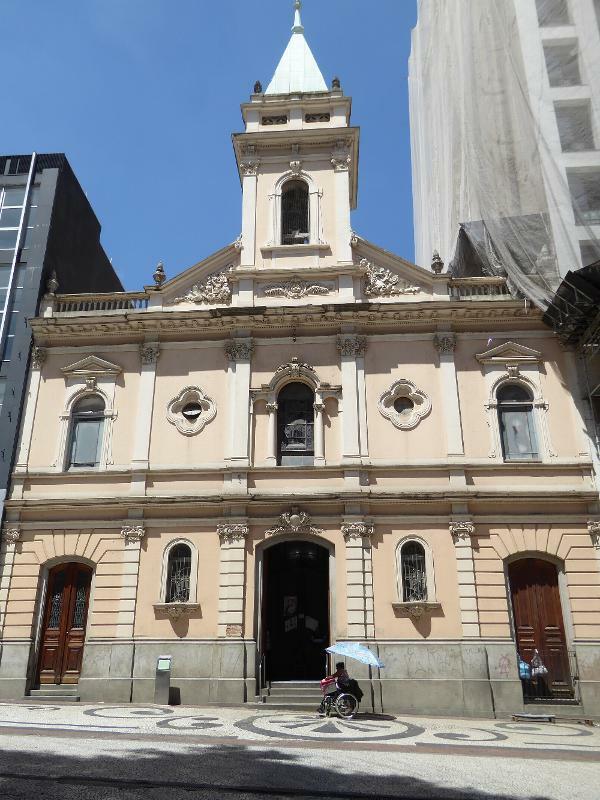 Speaking of churches, downtown São Paulo got some new ones in the 20th century. Here, for example, is the San Bento or Saint Benedict monastery, closely modelled on the Archabbey of Beuron, about 50 miles south of Stuttgart. The architect Richard Berndl, was a professor at Munich University. The date on the facade, 1912, is a good reminder of Berndl's good fortune; he was a youngster, born in 1875. 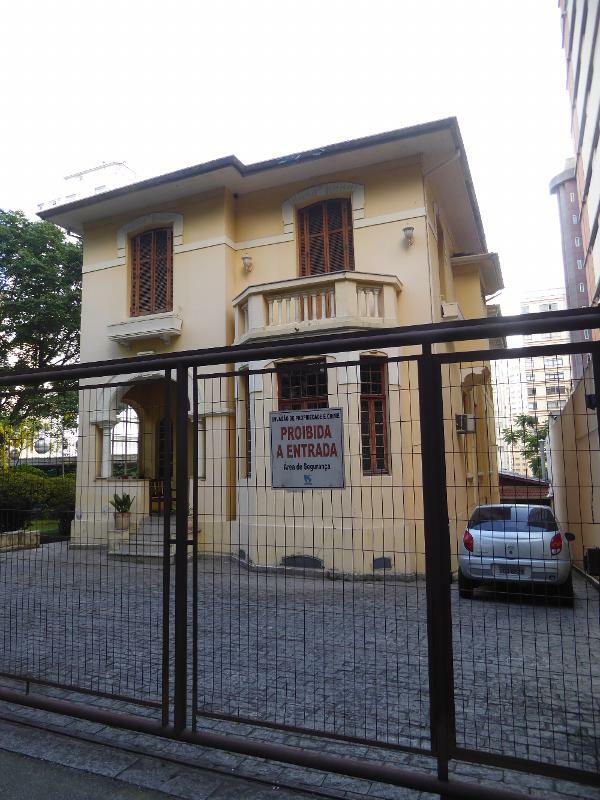 He lived until 1955, but this appears to be his only building in Brazil. 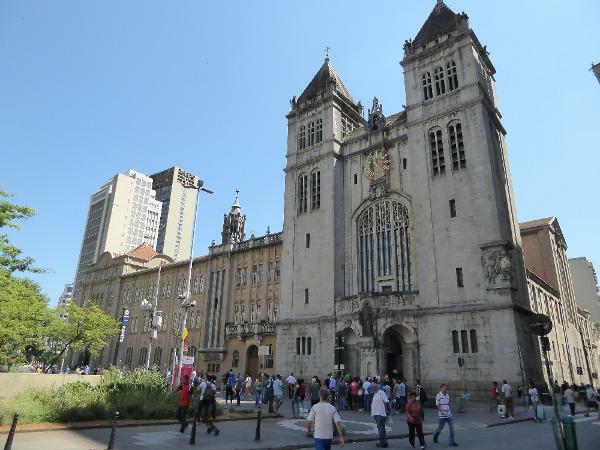 Nearly contemporaneous, this is São Paulo's cathedral, designed in 1912 by a German immigrant, Maximillian Hehl. Born in 1861, he died in 1916, long before the church opened in 1954. Meanwhile, highrises continued to grow, in this case the Banespa Tower, inspired by the Empire State Building. 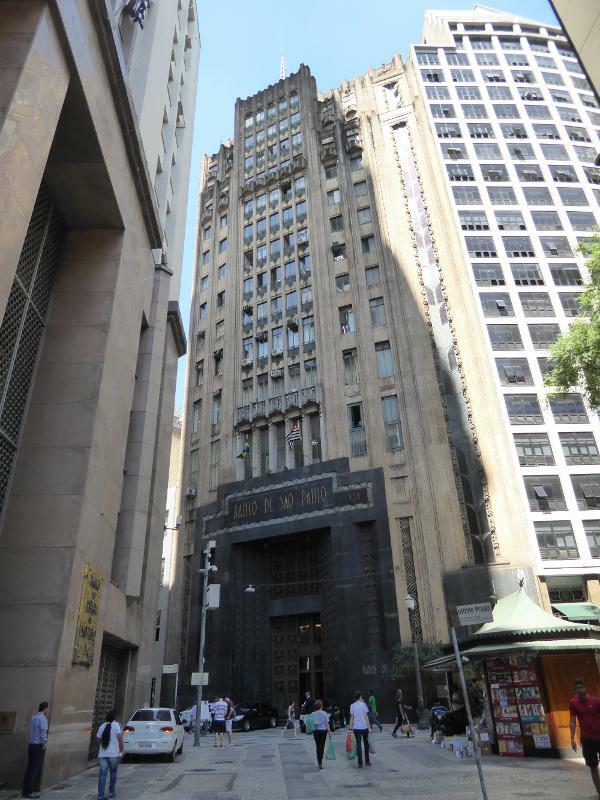 The architect was Plinio Botelho do Amaral; the building opened in 1947. Apparently this was the world's tallest building outside the US until 1953. 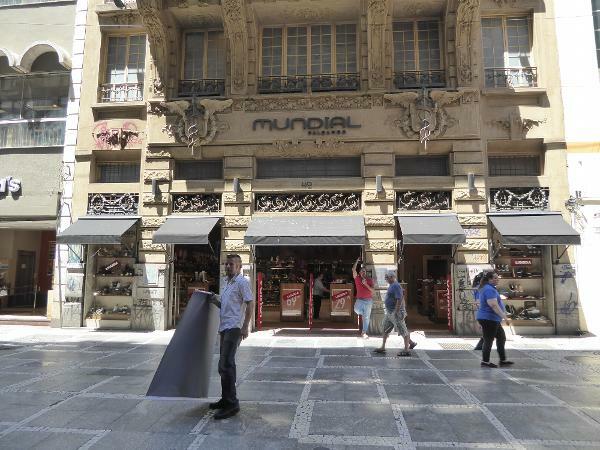 The bank itself was sold in 2000 to Spain's Santander Bank. 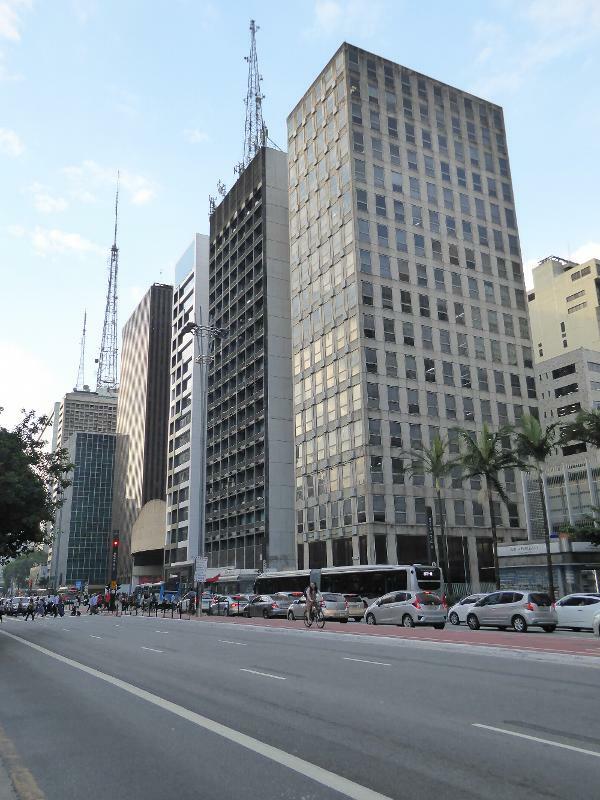 Renamed the Altino Arantes Building for Banespa's first president, the building has been repurposed as the Banespa Cultural Institute. Behold the so-1959 hand of Gordon Bunshaft, displayed here in the Edificio Barao de Iguape. 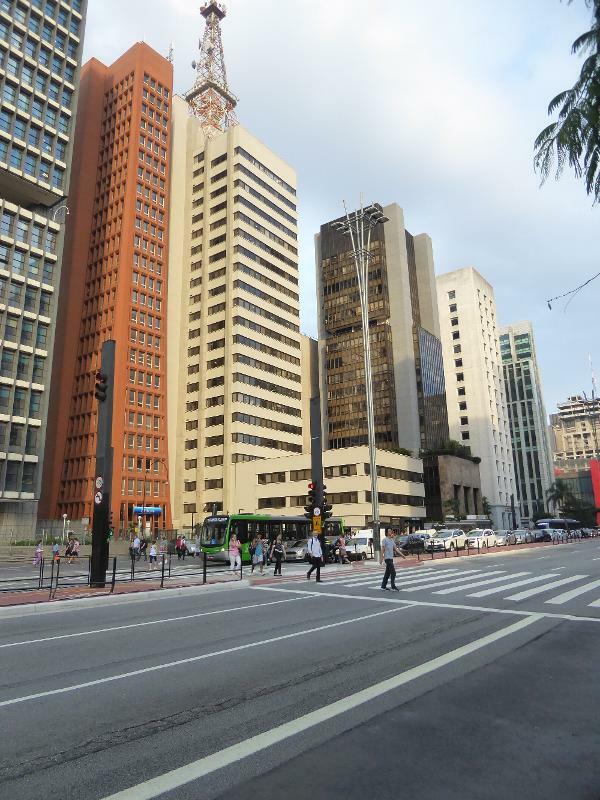 Vaguely reminiscent of Bunshaft's earlier Lever House in Midtown Manhattan, this building faces the church of Santo Antônio and was the headquarters of Unibanco, which disappeared in a merger with Banco Itaú in 2009. Bunshaft's building was imitated so many times in the years to follow that it's easy to overlook. Here we're only a five-minute walk away. The city's main north-south corridor runs under the axis here. We've jumped two miles south, and the landscape is still a forest of highrises pierced by a highway, here emerging from a tunnel into the light of day. 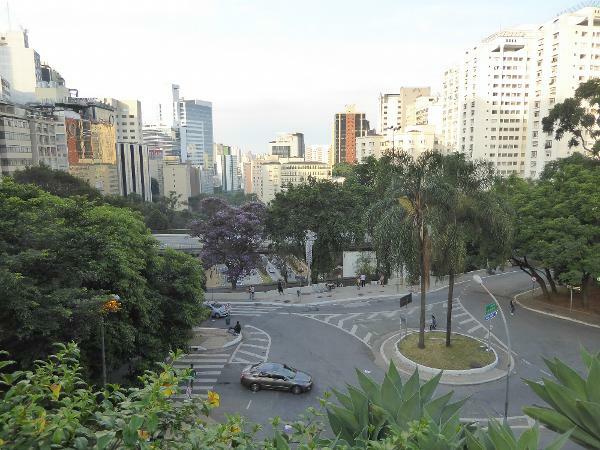 The tunnel runs under a precious thing in São Paulo, a park. 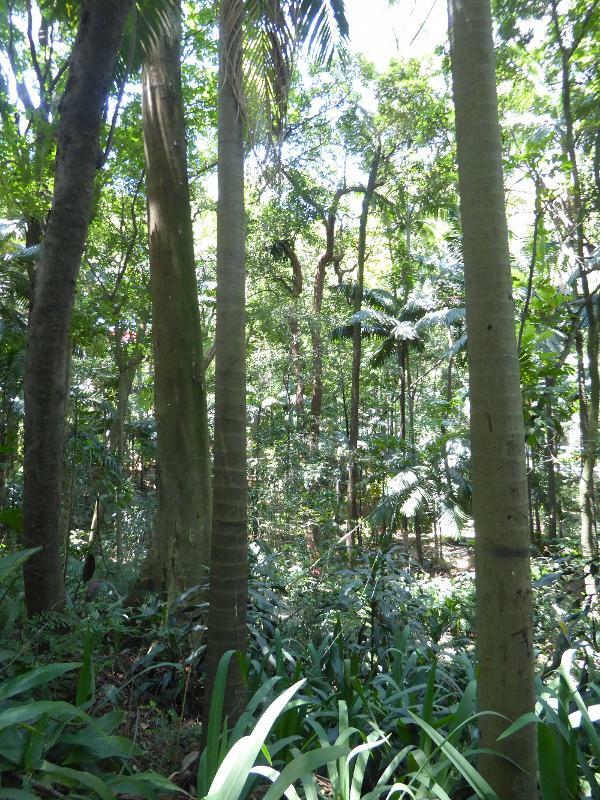 Skepticism is often admirable, but trust me: this is that park, a reminder of what the Mata Atlantica, Brazil's Atlantic Forest, once looked like. The park is small--two city blocks--but offers a moment of escape. 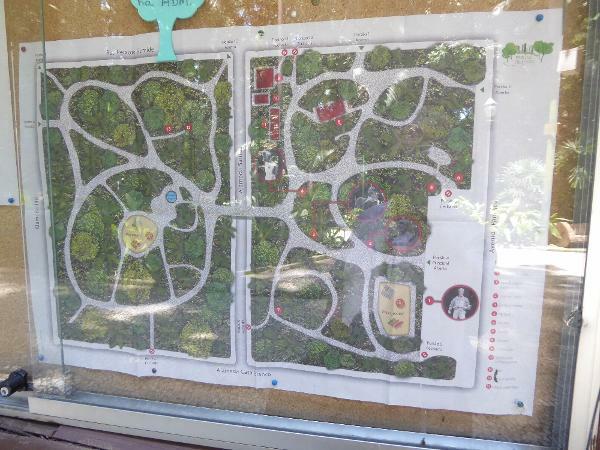 The highway tunnel, not shown on this map, runs right through this map from side to side; a bigger problem is the surface street that cuts the park in half. Traffic will not be denied. 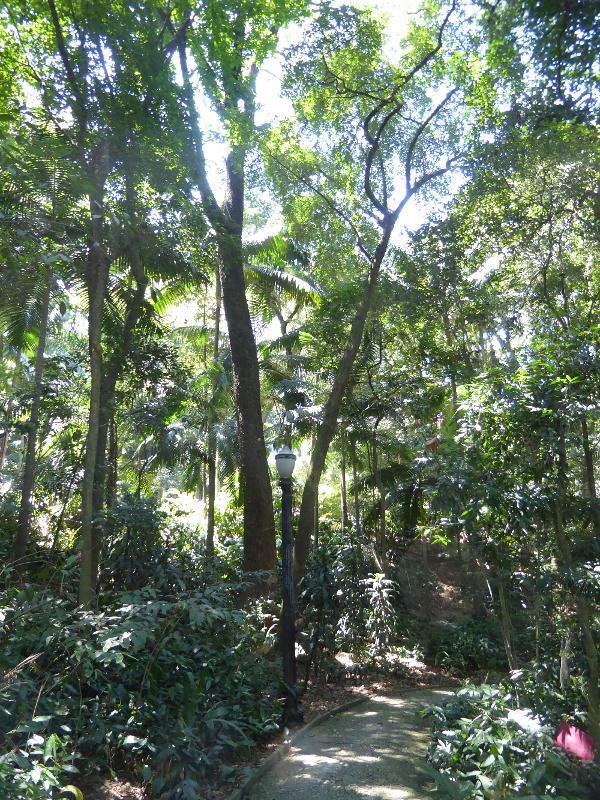 The park, known familiarly as the Trianaon, was laid out in 1892 along English-garden lines by Paul Villon, a painter and landscape architect, most of whose work in Brazil was done in Rio. Here's the guy who got the ball rolling on the neighborhood surrounding the park. 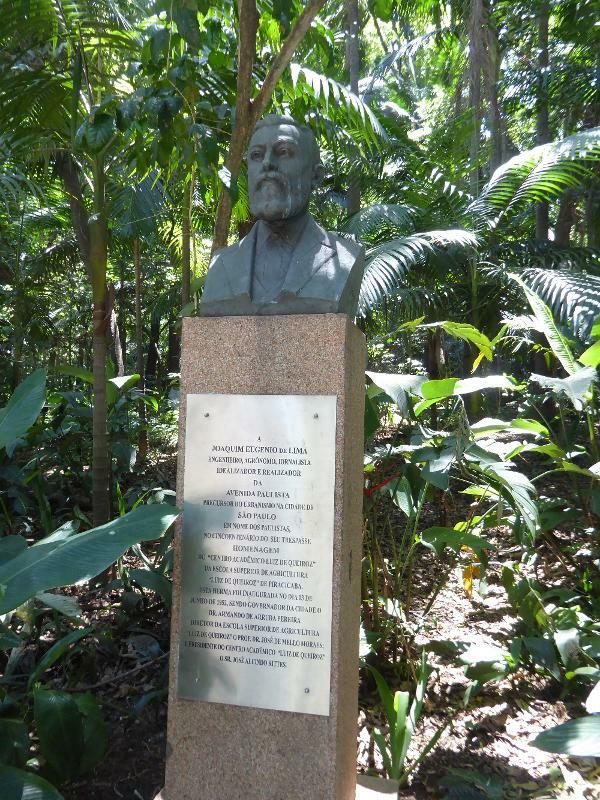 He was an engineer, Uruguayan by birth and German educated. 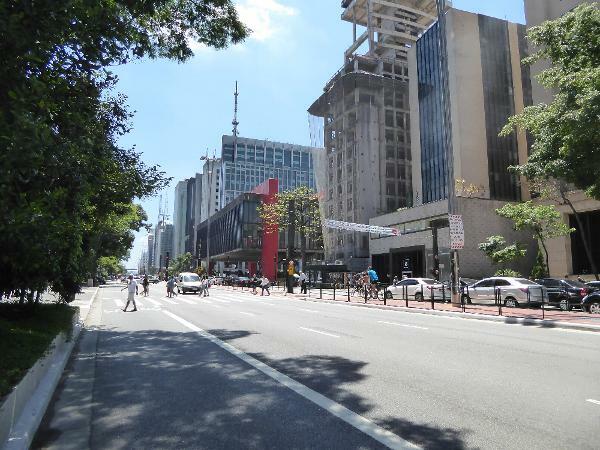 In 1891, with a partner, he bought some local farms and laid out the Avenue Paulista as what we might today call a high-end residential avenue. There was a tram on the street by 1892; asphalt came much later, in 1909. 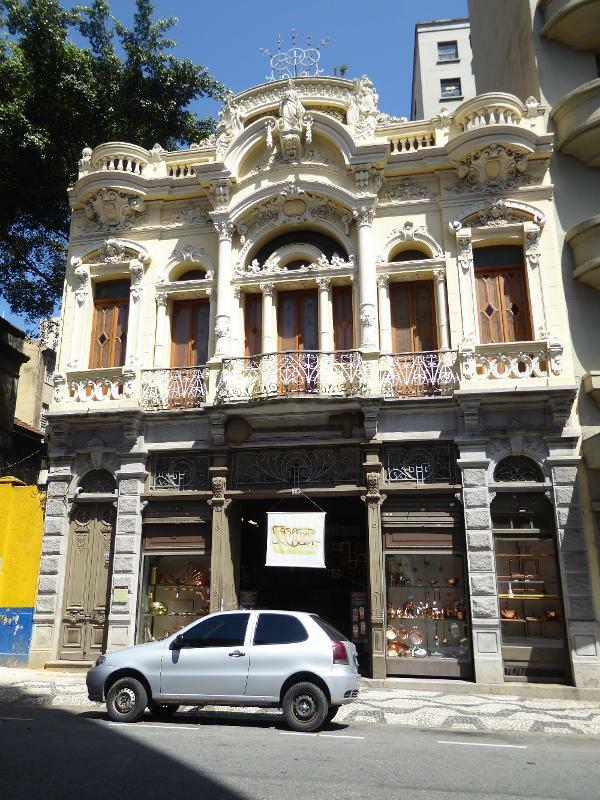 There are almost no survivors of that era, but here's one, the Residência Joaquim Franco de Mello, designed by a Portuguese architect, Antonio Fernandes Pinto, and built in 1905 for a local coffee baron. 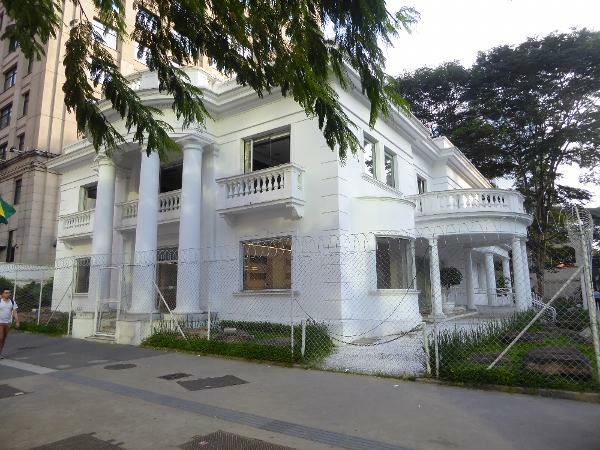 Avenue Paulista's mansions began disappearing in the 1950s; this one lingered too long, until a historic preservation law in 1992 suddenly forbade its demolition. Since then, it's been caught in litigation over the compensation due to its owner. In 2013 a court ordered renovation into an exhibition space, but three years later, nothing much see to have been done. Last of its kind: in the 1940s a Syrian merchant built this house a couple of blocks down the street. The family lived here until 1995, at which point their house was a curiosity. They moved out and rented the space to a bank. In 2017, the building was undergoing another renovation. 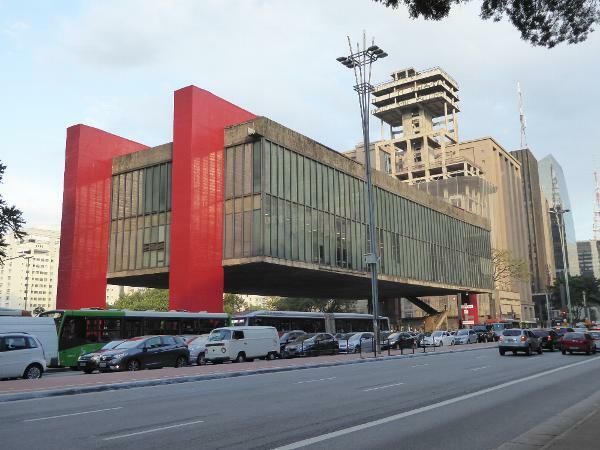 The most unusual building in the lineup is the Art Museum of São Paulo, which opened in 1968 and for some reason was inaugurated by Queen Elizabeth. The building sits on the site of an old club, the Belvedere Trianon, which was demolished in 1957 but which by that time had lent its name to the Trianon Park, which is just behind the camera. 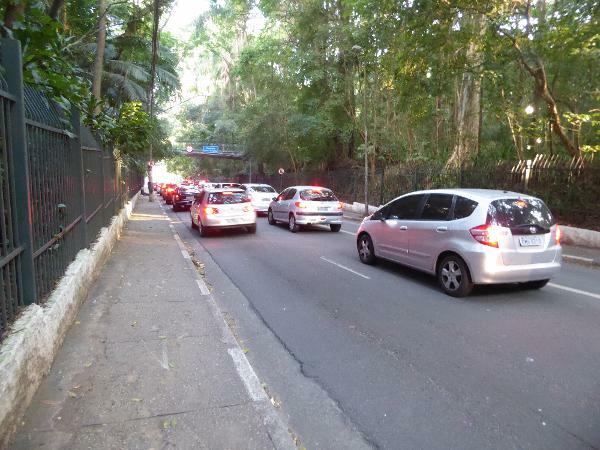 The tunnel under the park continues under the museum, which was designed by a local architect, Lina Bo Bardi. The red paint was added about 1990, when the concrete posts were showing signs of deterioration. 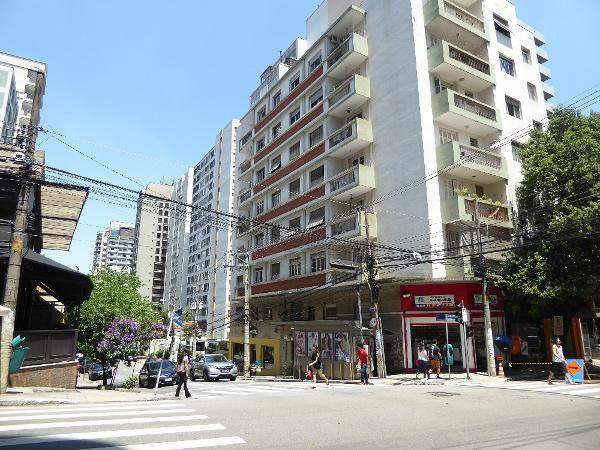 We've stepped off the Avenue Paulista and gone one block south to Alameda Santos. Land use has shifted from offices to residential, but the difference seems superficial. Here's where the same street bisects the Trianon, whose two halves are connected by the bridge in the distance. Somebody can presumably pinpoint this location, but we're only a couple of miles from the previous few pictures. We're coming in from the northwest to land at Congonhas Airport. Now let's just rent a car and try finding our way around without a GPS. I dare you!